At the end of part 1, Goober had just been put into a large cage to keep him from endangering himself in unsafe hiding spots and to begin attempts at socialization. For the first couple of days we mostly left him alone to acclimatize to the cage and kept part of the cage covered with a blanket to ease the transition. At the start we had a “donut” bed on the floor of the cage along with a sturdy cardboard box (to give him something to jump up on until I could set up a better shelf), and free-standing water and food bowls. His first couple of nights in the cage, his exploring and attempts to find a way out resulted in the water and food bowls being spilled, causing the donut and box to be soaked (eventually I got bowls that mount to the bars of the cage). He never did use the donut, so that was removed. The cardboard box was then fixed to the back of the cage with packing tape to keep Goober from spinning it around so that we couldn’t see him. The first part of the socialization process involved placing food on the end of a plastic wand (like the handle of a cat toy) and offering it to the cat, then using a cloth-wrapped end of the wand to pet the cat. The idea is to keep your hands as far away as possible while getting the cat used to being touched and rewarding him for accepting the touches. Goober wouldn’t even sniff the food that was offered, he just sat scared and staring, making himself as small as possible. He didn’t protest the petting with the wand – he didn’t react to it at all. In order to track their progress, I made up a socialization scale to measure their reaction to the food and the petting. Each scale goes from zero to three. For the food, Goober started at a zero – no visible reaction. For the wand petting, he started at a one – allowed petting, but didn’t react positively (zero would be attacking the wand). The hope was to get each statistic up to a three consistently, meaning approaching the wand and licking the food off then showing a significant positive response to the petting. Goober’s catatonic state during the feeding/petting sessions made it hard to know if he would ever show any progress. We ordered some herbal calming drops and treats, but never noticed any significant effects. Over the course of the first week, however, he seemed to accept the petting more and showed signs that he might be enjoying it a little (squinting, relaxing his body). It still always started with a fearful response, though. Since he was accepting the wand pettings, I switched to a regular brush towards the end of the first week. Even though this put my hand in close proximity to him, which raised the initial fear response, he seemed to enjoy the actual brushing even more. The next day, I pet him with a couple of fingers while using the brush and by the end of the day was petting him with a full hand and scratching his cheeks/chin. The normal process called for using a gloved hand at first, with the assumption the cat would react negatively, so the progress was impressive. 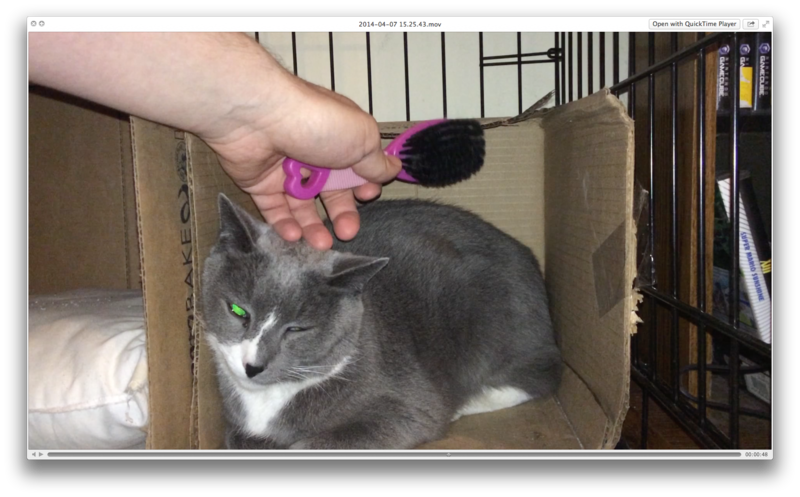 Goober being brushed/petted early in the socialization process. During the first week, we were also concerned that Goober wasn’t eating very much and wasn’t leaving much in the litter box. Everything eventually improved, but we were on the verge of bringing him to the vet and weren’t relishing the idea of trying to get him into a carrier (especially knowing that he has never had his claws clipped). Goober relaxes in his bed. 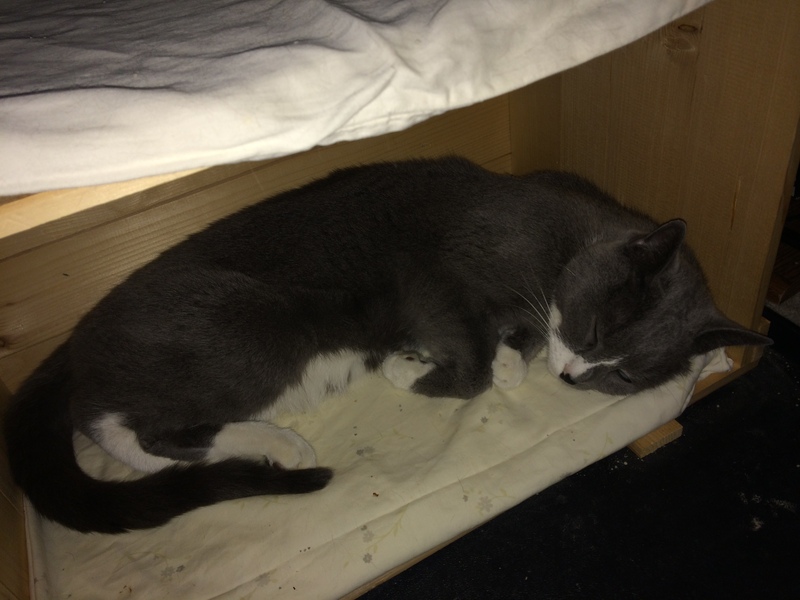 I attached carpet padding covered with old pillowcases to the inside and top of a wooden box to give him a comfortable bed and shelf. Over the next couple of weeks, Goober continued to improve, eventually reaching the point where he would lick food off of our fingers and would start eating his meals while we were petting him. Although the progress was great, it was still sitting on top of fear that hadn’t seemed to change. Goober always withdrew a little at the start of each session and never showed signs of welcoming our presence. The next step in the socialization process was to briefly pick the cat up by the scruff, then set them back down and give them a treat in order to introduce the idea of being picked up and eventually held. Goober never seemed ready to move to this step, though we began making plans to try it – he had surprised us with his acceptance of petting, so maybe this would go smoothly as well. While all of this was going on, The Grey Fox was still loose in the basement. When he would walk near Goober’s cage, Goober would walk over, meow a little, and rub up against the cage bars. He definitely missed his brother, but his brother showed no signs of returning the affection. Before being caged, we had observed The Grey Fox mounting Goober while Goober quietly protested. As the more assertive, bolder cat, The Grey Fox had also been monopolizing the food prior to Goober’s caging. It saddened us to think that Goober’s only contact for eight years was with a dominating cat who at the same time was his only source of comfort. The two seemed to feed off of each other’s energy, so we decided it was time to separate them, at least for a while. I catch up The Grey Fox’s story to this point in part 3.